Oil water separators are used to separate oils and solids from a variety of wastewater discharges. Above ground oil water separators will remove large quantities of free or mechanically emulsified oils from a waste stream. Our units can process oily wastewater at rates between 2 to 70 gallons per minute. Ecologix oil water separators use parallel corrugated plate technology that causes oil droplets to increase in size, and separate more quickly. We offer a unique inclined plate design, called HD Q-PAC. The Q-PAC is made of a structure of interconnecting plates with many crossing points. As the oil/water mixture flows through the separator, new droplets coalesce with retained droplets and form larger droplets. The enlarged droplets rise to the surface and decant from the separator. All system designs meet or beat the guidelines of API-421 and ASTM-D19.31.11.4. 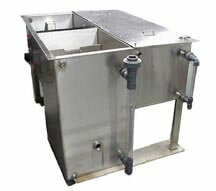 Oil water separators designed with the sludge hopper option allow for the natural settling of heavy solids. The hopper has a port that can be connected to a sludge transfer pump. Oil water separators designed with the clean water sump allow for a float swith and submersible pump for pumping clean water into a different location. Oil water separators can be built with both sludge hopper and clean water sump to perform multiple tasks in a single unit. Captured oil can be collected for resale or reuse. 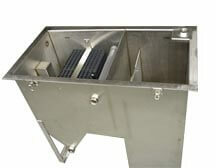 The optional oil containment compartment has an upper and lower port for pulling oil out of the holding chamber. Oil water separators can be modified with sight glasses to allow for visual inspection of clean water sump and oil containment tank levels. The oil water separator is a special purpose, prefabricated, parallel-corrugated plate, rectangular, gravity displacement, type oil water separator. The separator is comprised of a tank containing an inlet compartment, separation chamber, sludge chamber, and clean water outlet chamber. 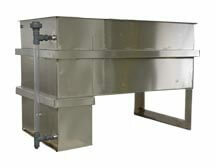 The tank is built of a single wall construction conforming to ASTM A240, type 304 stainless steel. Welds are in accordance with AWS D1.1 to provide a watertight tank that will not warp or deform under load. All connections 3″ and smaller are FNPT couplings. All connections 4″ and larger are flat face flanges with ANSI 150 pound standard bolt circle. Use flanged piping connections that conform to ANSI B16.5. After shop hydrostatic test has been successfully completed, a coating system is applied to the interior and exterior surfaces of the separator. Interiors and exteriors are sandblasted to SSPC-SP10 & SSPC-SP6; Interior lined with Tnemec Series 61 liner to 9 mils MDFT; Exterior coated with polyamide epoxy to 6 mils MDFT. The tank is provided with properly sized lifting lugs for handling and installation. The tank comes with a vapor tight cover for vapor control. Gas vents and suitable access openings to each compartment are provided. The covers are constructed of the same material as the tank and are fastened in place. A gasket is provided for vapor tightness. 304 SS Latches will are provided for cover attachment. 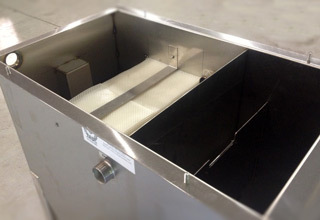 The inlet chamber is comprised of a non-clog diffuser to distribute the flow across the width of the separation chamber. The inlet compartment is of sufficient volume to effectively reduce influent suspended solids, dissipate energy and begin separation. The media sits elevated on top of a sludge baffle. 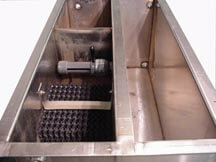 The sludge baffle is provided to retain settleble solids and sediment from entering the separation chamber. 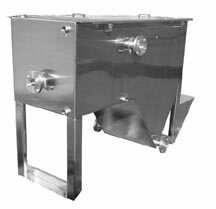 The oil separation chamber contains HD Q-PAC Coalescing Media containing a minimum of 132 square feet per cubic foot of effective coalescing surface area. The medias needle like elements (plates) are placed at 90 degrees to the horizontal or longitudinal axis of the separator. Spacing between these elements are spaced 3/16″ apart for the removal of a minimum of 99.9% of free droplets 40 micron in size or greater. The elements are positioned to create an angle of repose of 90 degrees to facilitate the removal of solids that may tend to build up on the coalescing surfaces, which would increase velocities to the point of discharging an unacceptable design flow rate shall be maintained throughout the separator packed bed including entrance and exit so as to prevent re-entrainment of oils with water. Flow, through the polypropylene coalescing media, is a crossflow perpendicular to the vertical media elements such that all 132 square feet/cubic foot of coalescing media surfaces point upwards, so as	not to be available for contact with the crossflowing oily water. The media shall has a minimum void of 87% void volume to facilitate sludge and dirt particles as they fall off the vertical elements and settle in the sludge compartment. The media, when installed in crossflow oil water separator, meets US EPA Method 413.2 and also European Standard 858-1 for oil water separators. An oil retention, underflow weir, and overflow weir are positioned to prevent re-suspension of settled solids. The oil separation chamber comes with a rotatable pipe skimmer for gravity decanting of the separated oil to an integral product storage tank or an external product storage tank. The tank comes equipped with a clean water chamber which allows the water to leave the separator by pumped / gravity flow through the clean water outlet port. 1″ vents are provided with vent piping to the atmosphere.